DESIGN SOLUTION: Bold curving retaining walls anchor the house in the landscape and bring a sense of order to this sloping property. The strong geometry created a motif strong enough to make the garden that sit comfortably in its surroundings. 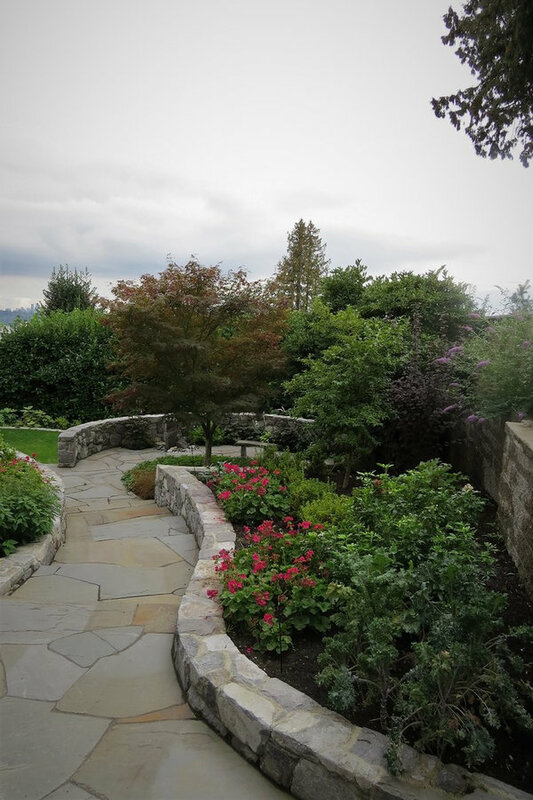 Special attention was given to preserving the existing site contours to minimize regrading, resulting in curved, gentle slopes with low-rise retaining walls. 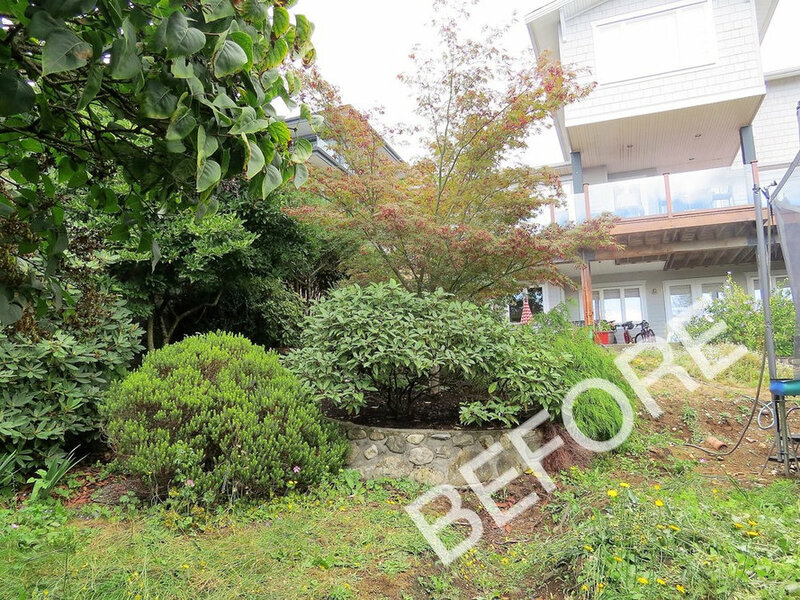 BEFORE: The house was perched atop a steeply sloping lot overgrown by shrubs, feeling unstable and lacking connection to the landscape. 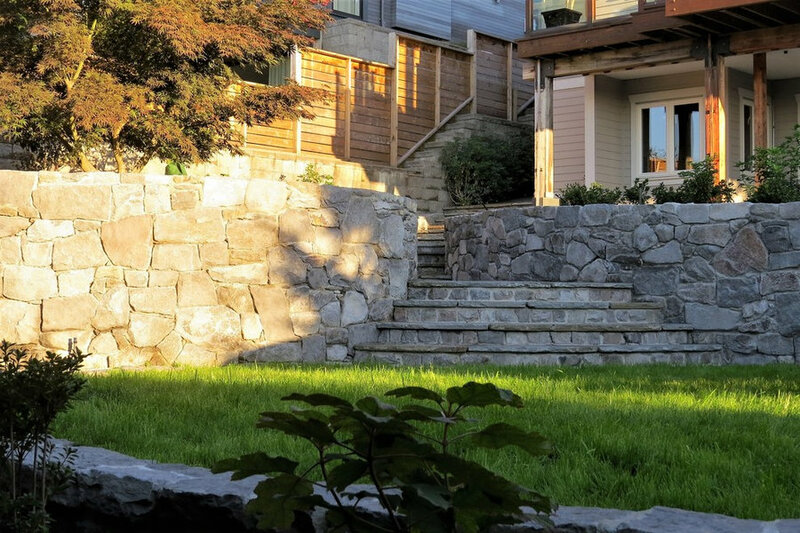 The flagstone steps and retaining walls flow down together and morph into a seating area created around a Japanese maple that was preserved. 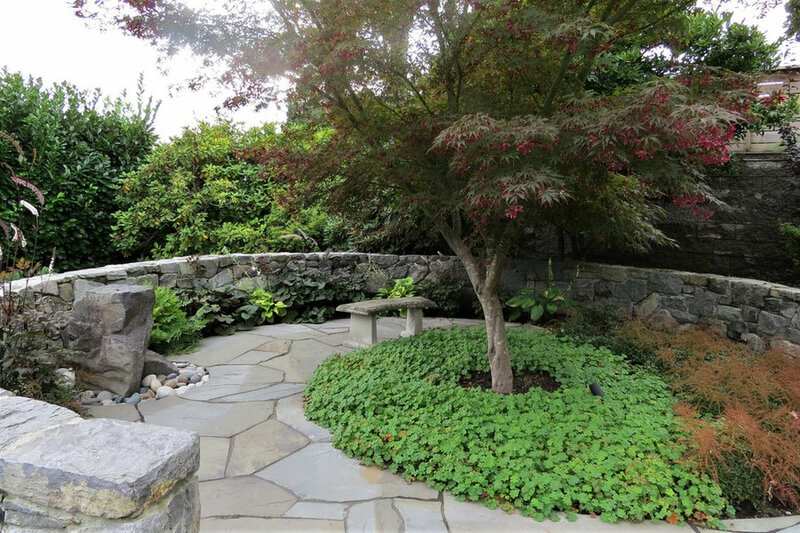 With its new meditation bench and a water feature, this is now the clients’ favorite space in the garden. 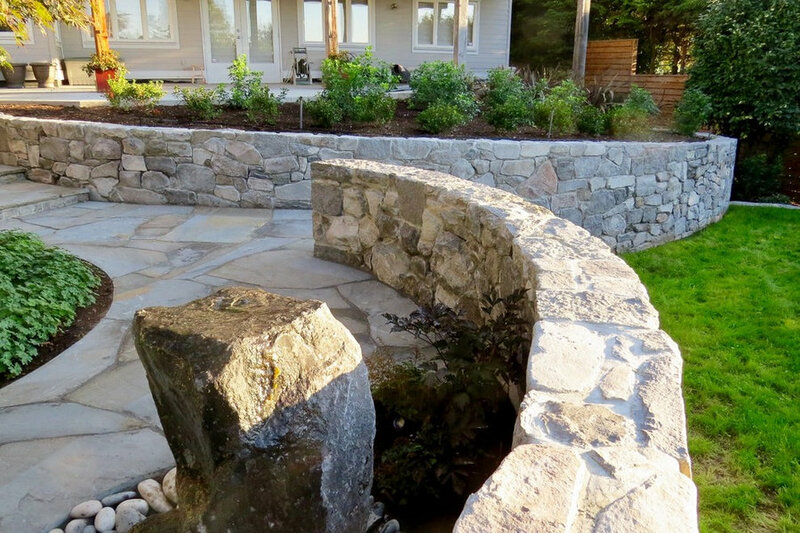 The curved retaining walls with the steps direct the eye through the garden, inviting travel through the garden. 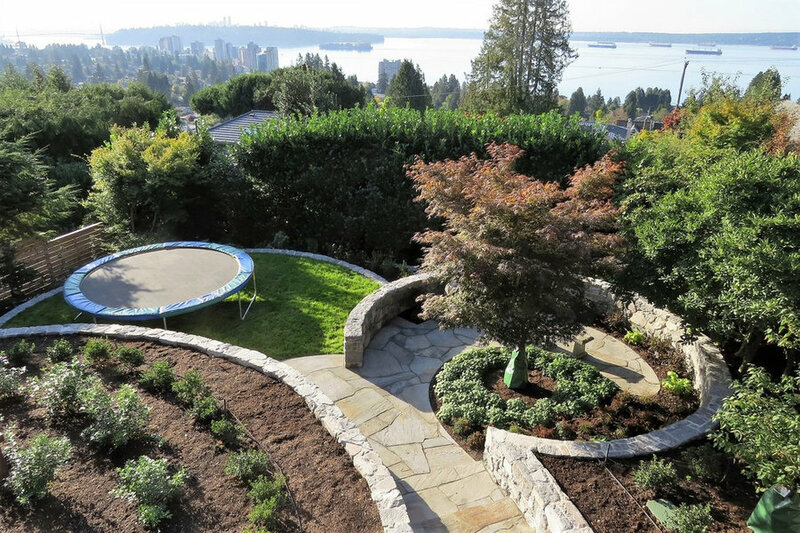 This garden is designed to be viewed particularly from above, using strong geometry to create an effective bird’s eye view, but also creating a clear journey from the house’s lower patio to a play area and a berry patch. 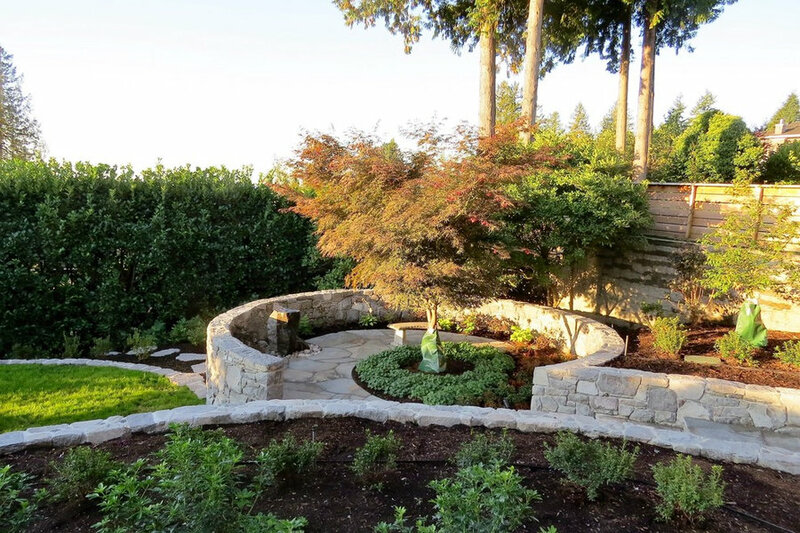 The design balances the rich plant palette with the strong geometry of the hardscape and organizes the space in different areas with different feels, including an intimate, serene seating area with a water feature. The shape of the path in the seating area references the yin-yang symbol in a nod to the previous garden space. The seating area also offers a perfect vantage point to view the rest of the garden and to supervise children in the play area. The surrounding low wall provides a sense of enclosure and intimacy within the landscape. 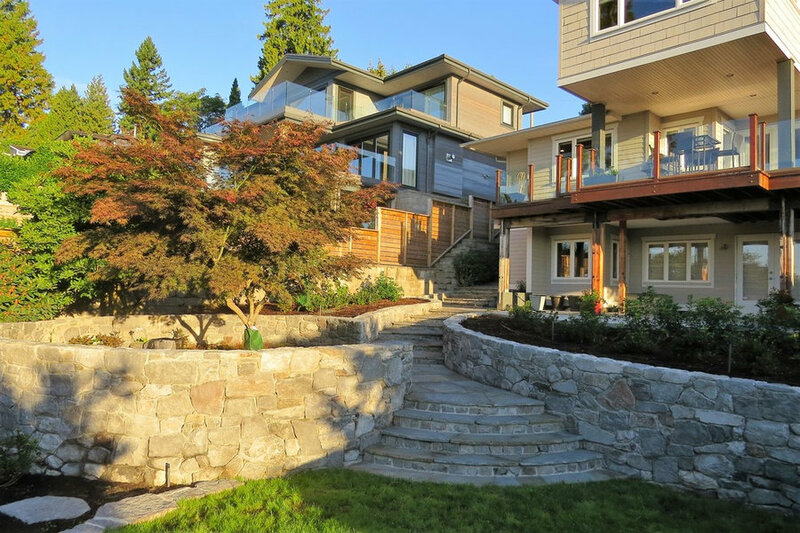 Geometric shapes add interest, particularly when viewed from the home’s deck, while not competing with the stunning panoramic views of the ocean and downtown Vancouver.